Our Gospel message comes to us today from Luke the 19th chapter, beginning at the 28th verse. All mighty God, we thank you for your word and the way that you in it revealed to us who you are and what you've done for us in Christ. Now as we open that word we pray that your spirit may be present, that all thoughts of worry or distraction may be removed and that the Spirit will allow us to hear your voice. And so, oh God, fill us with your spirit through the reading and proclamation of your word this day. We pray in Jesus name. Amen. Christianity is filled with paradoxes. Take the Palm Sunday parade, for example. In this parade an almighty king rides to his death, and a humble king commands our praise. Let’s untangle the Palm Sunday paradox to see what we can learn about Jesus and about ourselves. As far as we know, Palm Sunday was the only time as an adult that Jesus hitched a ride on something other than a boat. That might not seem like a big deal but Jesus draws our attention to the event by the way he acquired his ride. Instead of walking into Jerusalem as he had done dozens of times before, Jesus deliberately paused a couple of miles outside of the city and directed two of his disciples to fetch a donkey colt for him. It wasn’t that Jesus was tired and wanted to ride the last couple of miles. No, he was intent on fulfilling a prophecy that had been made over 400 years earlier that the Messiah would ride into Jerusalem on the colt of a donkey (Zechariah 9). Jesus had a specific colt in mind so he told his disciples exactly where they would find this animal and what they should say when the owner asked them where they were going with his donkey. When the two disciples arrived in town they found everything as Jesus had described. The fact that Jesus knew these details demonstrates his omniscience – his divine ability to know all things. Do you see the comfort here? If Jesus knew that a donkey was waiting for him in the next town, he certainly knows what’s down the road for you. You may not know how that medical test is going to turn out but Jesus does. Nor may you know whether or not there will be any decent jobs for you when you get done with your education but Jesus already has in mind how he plans to provide for you. Understanding that Jesus knows all things gives us confidence to follow his directions. Though Satan would have us believe otherwise, living by Jesus’ words will never send you on a fool’s errand. The crowd that cheered Jesus as he entered Jerusalem had seen proof of this. Our text reports: “…the whole crowd of disciples began joyfully to praise God in loud voices for all the miracles they had seen: ‘Blessed is the king who comes in the name of the Lord’” (Luke 19:38b). Because of the miracles they had witnessed, the Palm Sunday crowd was convinced that Jesus was a powerful king worth following. Just before his parade into Jerusalem Jesus had healed two blind men in Jericho. Think of how modern medicine has yet to give someone their sight back. Sure, doctors can improve eyesight through laser surgery but that process can also decrease one’s night vision. I doubt if those two men in Jericho had any problem with their night vision after Jesus healed them. If you’re not impressed with that miracle, then be impressed, as the crowds were, with how Jesus had raised his friend Lazarus from the dead (John 11). Jesus had done this simply by telling the dead man to come out of the tomb and he did! It’s no wonder Jesus said to Lazarus’ sister: “I am the resurrection and the life. He who believes in me will live, even though he dies” (John 11:25b). Jesus is a great king to be sure – an almighty king since he even has power over death. But here’s the paradox. This almighty king rode into Jerusalem to die! Jesus’ choice of transportation, a donkey colt and not a white stallion, hinted at this truth. Jesus was not headed into Jerusalem as some tough general who would kick out the dreaded Romans, as many hoped he would. Instead he meekly sat on the back of a donkey like a bundle of wood headed for someone’s fireplace. Why did this almighty king ride into Jerusalem to die? The song the disciples sang as Jesus rode forth gives us the answer. “Blessed is the king who comes in the name of the Lord! Peace in heaven, and glory in the highest heaven!” (Luke 19:38b) This song is not unlike the one the angels sang at Jesus’ birth, is it? The Christmas angels proclaimed: “Peace on earth!” while the Palm Sunday crowd sang, “Peace in heaven!” With Christ’s birth God’s peace had come to earth. Now, with his approaching death, Jesus was going to bring peace to heaven. How? Like the king who surrenders to the enemy so that his army can go free, Jesus gave himself over to his heavenly Father’s justice. On the cross Jesus suffered the punishment we deserve for our sins so that God is no longer angry with us. There is now heavenly peace between God and us. Yes, as an almighty king Jesus could have stopped his suffering at any moment. When Jewish leaders taunted, “If you are the Christ, come down from the cross and we’ll believe you!” Jesus could have come down from the cross in a heartbeat. He didn’t, however, because his heart beat for you. He thought of how if he didn’t suffer and die, we would have to spend an eternity in hell away from his love. That’s not what Jesus wants. He wants us all to be in heaven with him. While Jesus died to forgive all people not everyone will be saved. That’s because many reject Jesus as their savior. They think they can make it into heaven on their own terms. That’s what the Pharisees in our text supposed. That’s why these religious leaders were offended when they heard Jesus’ disciples proclaiming him king. They wanted Jesus to put a stop to it. But Jesus answered: “I tell you, if these were silent, the stones would shout out” (Luke 19:40). This brings us to the second Palm Sunday paradox. Although Jesus is an almighty king, he showed himself to be a humble king who came to serve us by dying on the cross. And although Jesus is a humble king he still commands our praise. Jesus didn’t tell the crowds to be silent on Palm Sunday because if they didn’t proclaim him king, the very stones that lined the road would rock the valley with that acclamation. Our Epistle lesson today from Philippians 2 teaches us a similar truth. It reminds us that if we don’t willingly acknowledge Jesus now as Lord and Savior, we will be forced to do this come Judgment Day. Only then this forced confession will no longer save us from God’s eternal wrath. Friends, have you acknowledged Jesus as God and Lord? Do you believe that he has forgiven all of your sins and that only through faith in him you will go to heaven? You may have made this confession in your heart but does it show with your hands? The people in the Palm Sunday parade demonstrated their invisible faith when they threw their coats down on the ground for Jesus’ donkey to walk over. These coats weren’t rags, mind you; they also doubled as the only blankets many of these people owned. Is that the kind of praise and service we bring to our king? Are we eager to sing his Hosannas not caring who hears us, or are we bashful even about praying in public before we eat a meal? Do we eagerly give Jesus the shirt off our back, or are we unwilling to support ministry efforts that cost us a lot of time and money? Jesus will put up with a lot in our lives but second place is not one of them! Or perhaps you have eagerly served Jesus but since it didn’t seem that others appreciated your efforts you’ve decided to give up, or at least not try as hard. Even as a chaplain I’m tempted to think that way. My sinful nature is so needy and egotistical that if any ministry effort of mine goes unacknowledged my sinful nature fumes. That’s why I should read often today’s sermon text. Did you notice how our text didn’t name the two disciples Jesus sent to fetch the donkey? The Bible doesn’t tell us who those disciples were because Palm Sunday was not about them; it was and is about Jesus. Isn’t that true about anything we do around here, or at home, school, and work? We pack lunches, we vacuum floors, we make photocopies, we teach children how to tie shoelaces, we prepare Bible lessons - not so that we’ll get a pat on the back but so that others may be served and Jesus may be glorified. And Jesus deserves our glory, doesn’t he? The meek, but not weak, king did not hesitate to suffer hell to pay for our sins of treating him and his heavenly Father with contempt. An almighty king rides to his death, and a humble king commands our praise. That’s the Palm Sunday paradox. As I said earlier, Christianity is filled with such paradoxes – most of them center on the person of Jesus. Jesus who is both Lamb and Shepherd, both King and Servant, both gift and cost, both our death and our life. Yes blessed, that is, spiritually happy is the one who comes to the Father in the name of the Lord Jesus! God of unfailing Love, We come before you on this day with thankful and joyous hearts because your love knows no bounds. No boundaries, limits, or obstacles—including those of our own making—can thwart your loving kindness from following us all the days of our lives. The Bible texts of the Old Testament, Epistle and Gospel lessons are from the New Revised Standard Version Bible, copyright 1989 by the Division of Christian Education of the National Council of the Church of Christ in the USA, and used by permission. Sermon contributed by Rev. Daniel Habben. 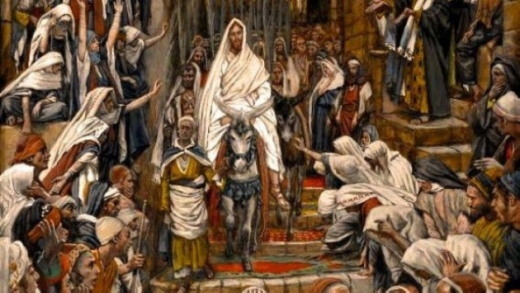 Ponder the Palm Sunday Paradox 1) An almighty king rides to his death. 2) A humble king commands our praise.